Spend 11 days traveling in the city and countryside of Cambodia and Thailand. Experience these amazing countries and their traditions in a unique adventure that will bring you from Siem Reap to Bankok to Chiang Mai with a lot in between. Travel between villages by day and get an up close and personal experience with the people and places. Price includes all accommodations for 10 nights at Damrei Angkor, Galleria 10 Hotel, Shewe Wana Boutique Resort & Spa, and The Legend Chiang Rai. All transportation for 11 days during the tour. Private guide for the entire trip. Bike Rentals. All guided tours and entrance fees. Breakfast each morning (11 breakfasts), 5 lunches, and 3 dinners. Please note, itinerary is subject to change or adjust due to unexpected conditions such as weather or another reason we don't even know about yet. + Day 1: Welcome To Siem Reap! Upon arrival in Siem Reap, meet your guide at the airport and transfer to your hotel. Rooms are available for anyone who needs a nap. The rest of the day is free at your leisure. At night enjoy an Apsara Show and welcome dinner. Start the morning with an amazing bike trip to the most famous Khmer temples. 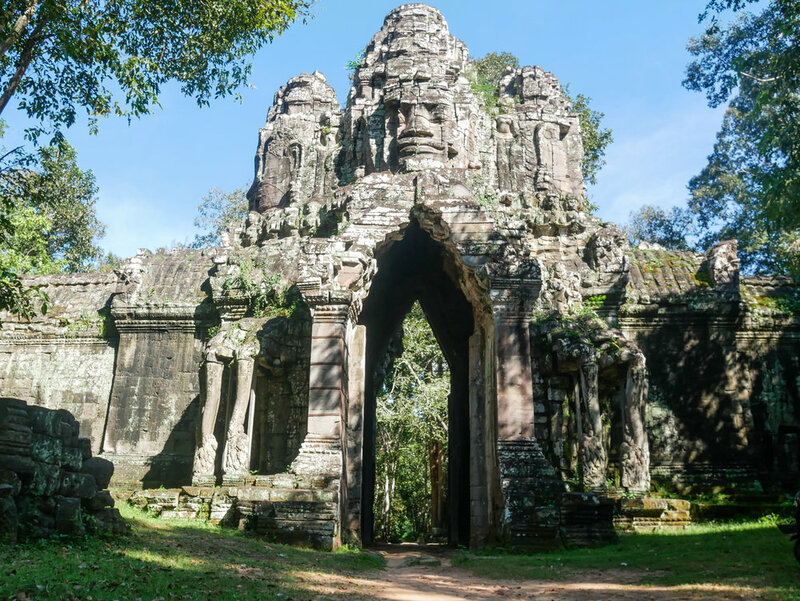 Leave your hotel in the early morning then take a small trail going through the forest, pass by a small village and arrive to Angkor Thom South Gate. Ride the wall of Angkor Thom from South Gate to Victory Gate on one of the most charming rides of Angkor complex. Continue on a short distance before arriving to the Elephant Terrace, 350m long, used as a giant reviewing stand for public ceremonies and served as a base for the king’s grand audience hall; and the raised Leper King Terrace, built in the 12th century and which features many beautifully sculptured Apsaras. Visit the famous Bayon built between 12th and 13th centuries, which is dedicated to Buddhism and composed of 54 gigantic towers featuring 216 smiling faces of Avalokitesvara; Leave from Bayon to the main road and finish your biking adventure by visiting the impressive and beautiful Angkor Wat, the largest religious monument in the world, capital of the Khmer empire and now Cambodian symbol. We will have lunch in a local restaurant in town. 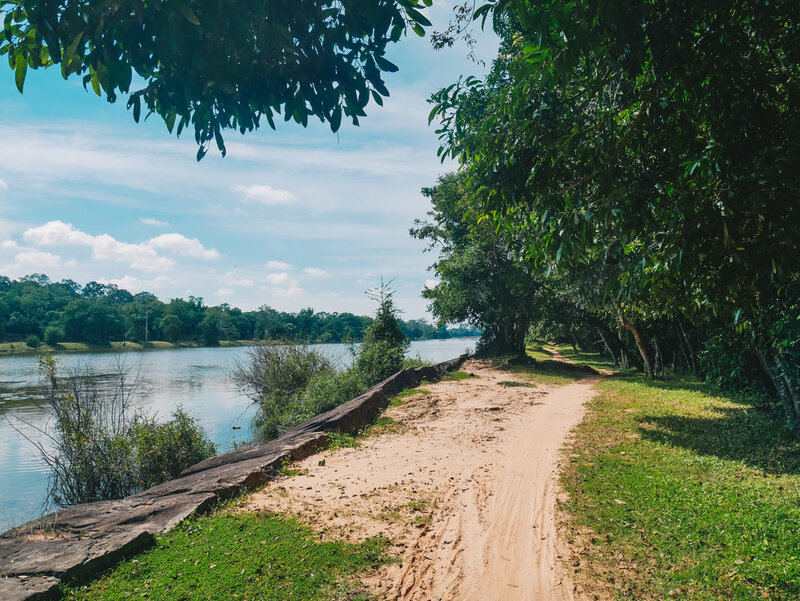 In the afternoon, we leave behind the hustle and bustle of Siem Reap to get on a hidden trail. Houses become increasingly rare and you pedal in the middle of lush vegetation or between the fields before arriving to the little forgotten Angkor temple of Wat Athvea. You will probably be the only people visiting this place. Continue on a beautiful red soil track. On each side you will see a succession of beautiful rice fields and lotus fields. Discover the beauty of the Cambodian countryside, its scenes of farm life and elegant sugar palms that characterize it. The ascent to Phnom Krom mount can be done on foot with direct stairs reaching the top, or by bike for the more adventurous. At the top, you will discover a small temple but also a splendid 360 degree panoramic view. You will feel the plenitude of the landscapes, the magnitude of Tonle Sap Lake and enjoy a retreat from the bustle of the city and Angkor site. It’s a wonderful place to admire the sunset and peacefully enjoy this magical moment. Transfer back to Siem Reap. The main goal of this tour is to preserve the natural habitat for wildlife on Kulen Mountain by giving local communities an alternative income from tourism instead of poaching and logging. In addition, it is a great opportunity to indulge in the natural surroundings of primary forest and jungle and spot wildlife, only a few hours from Siem Reap. You will also be able to learn about the local flora and fauna through the knowledgeable guides on this unique day tour on the outskirts of the city. The itinerary will allow you the viewing of silvered langurs and pig-tailed macaques, with an estimated view potential of 50% (the earlier the better). Even when the wild animals are not sighted, the tour takes in stunning scenery and is a unique and fulfilling day out. Then you will visit the Reclining Buddha, the River of the 1000 Lingas and head to the waterfall for swimming. At the end of the day, you will travel by van to Banteay Srei, where you will be welcomed by Banteay Srei CBT Association. After you settle at your home, you will enjoy a delicious dinner cooked by locals and stay overnight in the warm accommodations. Welcome to Bangkok! Upon your arrival, meet your guide at the airport and transfer to your hotel. The rest of the day is yours to relax or explore. Room is at disposal from 14.00 only. Tonight you will board the first operating wooden rice barge in Bangkok for a Loy Nava Dinner Cruise while enjoying a traditional Thai dance. You will drift past the magnificent riverfront of Chao Phraya, alternating from soaring skyscrapers to venerated temples. This is an experience you won’t want to miss! You will take the skytrain, also known as the BTS and glide through the city to reach the river, from there you can take a short boat trip to Tha Tien Pier starting with a visit of Wat Pho. Wat Pho is home to more than one thousand Buddha images, as well as one of the largest single Buddha statues: the Reclining Buddha. You will likely hear the monk’s morning chanting ritual emanating from the main hall during your visit. You will continue your walk to Wat Phra Kaew, known as the Temple of the Emerald Buddha and one of the most respected temples in Thailand. 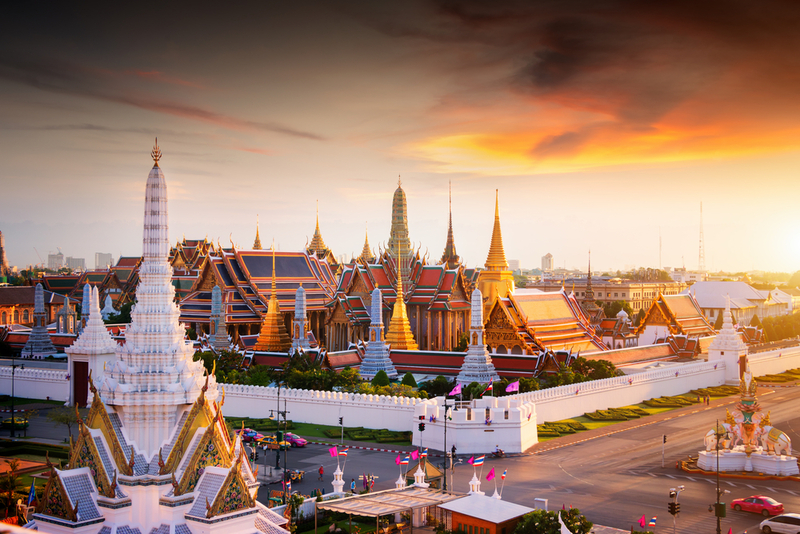 Your next unmissable stop will be the Grand Palace, home of the Kings of Siam of the Chakri Dynasty, originally built by King Rama I. Afterward, you will continue walk to the fascinating Amulet market. For a bit of adventure, jump on a Thai tuk tuk to visit Wat Saket and climb the heavenly Golden Mountain, which offers an incredible view over Bangkok. After that, you will travel aboard a Saen Saeb taxi boat to discover the Jim Thompson house, home of the famous founder of Jim Thompson Thai Silk. One last ride by BTS or taxi will bring you back to your hotel after a day full of striking emotions. Today is free at your leisure. Here, you’ll be met and transferred to your centrally located hotel. After that, visit Doi Suthep, also one of the city’s most spiritually noteworthy temples. Experience a unique private blessing and witness the monks’ chanting: an awe-inspiring and exotic experience that offers plentiful food for thought. Feeling suspended in a balance between earth and sky, admire the setting sun as the sky bursts into color. Just south of the Southern city gate you will collect your bicycle and head out to explore the vibrant city of Chiang Mai and its surroundings. You will get to see all different aspects of life in and around the city, from the busy and rather touristy historical center to the bustling local markets, to the city’s slum dwellings. During the frequent stops on the way, your guide will tell you all about the history, customs and local culture that make Chiang Mai such a special place. In the morning take a picturesque drive through agricultural Thai countryside to the Elephant Nature Park. You will hear touching stories about rescued elephants, learn about the problems these pachyderms are facing in Southeast Asia and discover how the Elephant Nature Park is helping to treat and protect them. Feed these gentle creatures, bathe them in the river and scrub them as they splash around. If going into the river is not for you then watch the elephants bathe and play while you stay dry on the sandy shore. After breakfast, head into the countryside to reach Ban Ruam Mit of the Karen minority group that live on the border between Thailand and Burma. The Karens have an extremely rich culture but have suffered persecution in neighboring Burma—they always have a few fascinating stories to tell. Then go by piroque, a long and narrow traditional boat down the Kok River before enjoying a delicious lunch. In the afternoon head to Chiang Rai to visit Wat Rong Kung, an unconventional Buddhist/Hindu temple. Continue driving to the famous Golden Triangle, the conjunction of Thailand, Laos, and Myanmar. Tonight you will go out and explore the city of Chiang Rai. By local tuk tuk you will make your way to the landmarks that are beautifully lit at night, such as the unique golden clock tower, designed by a famous local artist, where you can enjoy a small light and sound show, and the statue of King Mengrai, a place of reverence for local people, where you can make an offering of incense and flowers to ensure smooth and prosperous travels. Finally you will enjoy a tasty meal in a local restaurant at Chiang Rai night bazaar and have the opportunity for a leisurely stroll before returning to your hotel. You’ll have the day free to spend as you like. Later we will transfer to the airport for your flight back home.